LeBron James has the option to opt out of his contract with the Miami Heat after this season. The last time James decided, with much attention and fanfare, he formed a super-team with his pals Dwyane Wade and Chris Bosh with the Miami Heat. James now has a chance to redo his decision, but this time he is more experienced in both life and basketball and he understands more fully the ramifications of his decision. 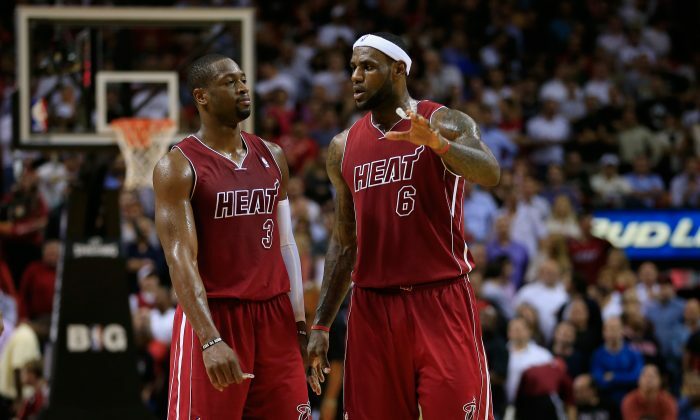 When James decided to team up with Wade he envisioned that the combination of their two great talents would overwhelm the rest of the league and lead to multiple championships. When they started sharing the floor together he realized that it would be harder than it seemed and that they both enjoyed having the ball in their hands and going to the basket. This provided teams a way to defend them by having defenders pack in around the basket, taking away both players’ favorite shots and allowing teams to commit multiple defenders to both players at the same time. Bosh also got pushed further away from the basket and although he has always been a good mid-range shooter none of the “big three” were elite enough shooters to win games consistently with jump shots. Despite all of their individual talent everyone’s numbers were down the first year they played with each other and they failed to win the title. It was not until team president Pat Riley and Coach Eric Spoelstra adjusted the team’s personnel and playing style that Miami really took off. They brought in more three-point shooters to spread out the floor so they could punish other teams for having all of their players committed to taking away shots at the rim from James and Wade. James (or Wade) with three-point shooters became the best offense in basketball and the Heat have won the last two titles. But last year James actually had a better overall plus-minus with five other Heat players than with Wade. In the playoffs there were eight Heat players whom James had a better plus-minus with than Wade. James and Wade only outscored the opposing team by .1 points per 48 minutes when they played together. Clearly both James and Wade are more successful when they share the floor with a multiple three-point shooters than they are when they play with each other. After three years the Heat have won two championships but neither of them were easy and they have been behind in multiple playoff series both times. They could just have easily won no championships. In their time together we can conclude that James and Wade often can’t share the floor effectively with each other. The surprising conclusion is that the sum is a failure compared to the individual parts. The Miami Heat may win the championship again this year but that is probably less than a 50% proposition. When James looks around he must see that his best teammates on the Heat overall are all in decline or getting ready to retire and they would be even less likely to win the championship again next year. So what should LeBron Raymone James do if he wants to win more championships and chase the greatest players of all time? He needs to find a new superstar to pair with. This time he needs to find one that fits with him better than Wade. He needs to find one in his prime or just entering his prime, in a big market, on an ascending team that could create the cap room for him. That’s a lot to find and really limits his options. Stars like Kevin Durant and Paul George both play in a small market on teams that do not have financial flexibility. Chris Paul’s talents with the ball overlap too much with LeBron’s. Kevin Love plays in Minnesota—another small market. Young pup Anthony Davis is also in a small market and the rest of the supporting cast is not in place yet. James needs to go somewhere where they are ready to win on day one. There is only one such place with one such superstar teammate. James needs to go to the Bay Area and play with Steph Curry! Curry is a superstar entering him prime—check! Curry is a perfect fit with James as possibly the best three-point shooter ever who does not need the ball in his hands or room to operate near the basket—check! The rest of the roster is ready to compete on day one with another elite three-point shooter in Klay Thompson, a third near-star and perimeter defender in Andre Iguodala, as well an adequate big man/rim protector in Andrew Bogut—check! In addition the Warriors have the trade bate to lure the Heat into agreeing to a sign and trade with David Lee and Harrison Barnes—check! The Bay Area is a big market—check! All of the checks are in place, in one place on the NBA map. The best place James could land himself next year is with the Golden State Warriors.